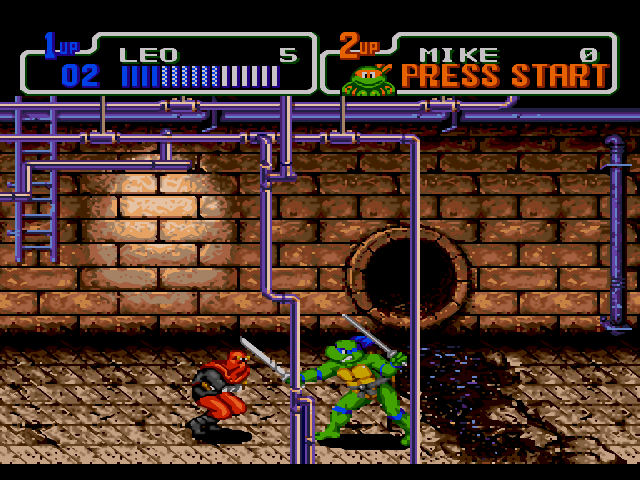 If you are an old school scholar, you have probably played or at least heard of Teenage Mutant Ninja Turtles IV: Turtles in Time, but did you know it has a cousin? 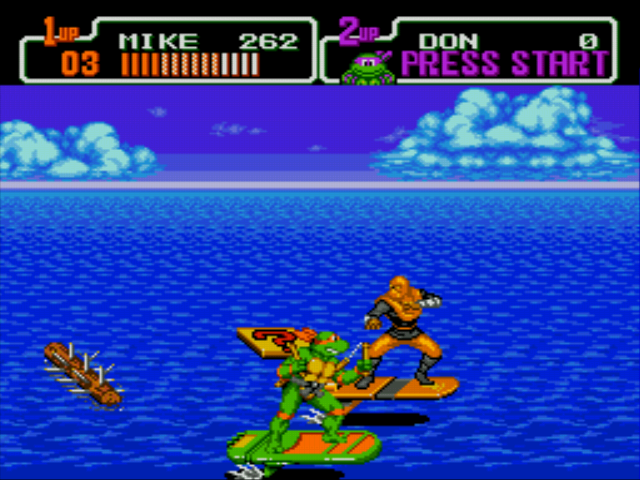 The turtles had a run on the Genesis at roughly the same time. 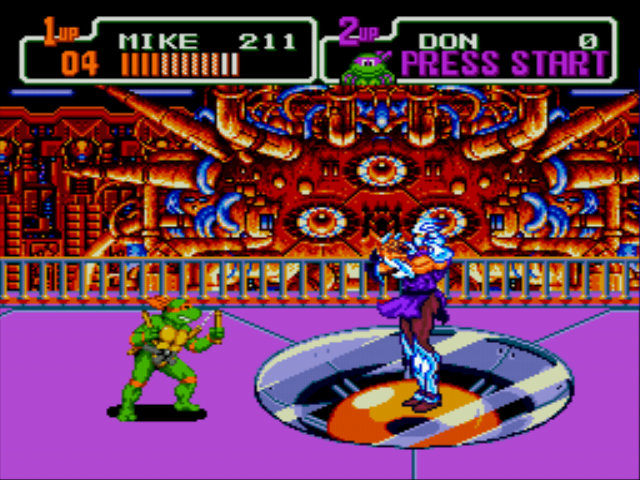 The game was subtitled The Hyperstone Heist. I came across this game on accident while going through the rows of used games at a nearby used book store. It was three dollars, and I am a huge fan of the turtles, having grown up with Turtles in Time, so I grabbed it up. I was pleasantly surprised to find that I had stumbled across a hidden gem worth around $40 on Amazon and the cheapest eBay sellers offering it for $20. Values aside, the thing that interested me the most was its uncanny resemblance to my childhood companion. As I looked over the box, I noticed a level that looked incredibly familiar. My first thought was Hey, that’s "Alley Cat Blues". Is this a port of Turtles in Time? At first glance, it is easy to wrongly assume that it is. It is actually a different game with a different story. Sure, the story is just pasted over the same slides that start "Turtles in Time", and yeah, the character sprites, soundtrack, and animations are similar, but there are changes in the game. The biggest difference in the game is the level layout. The levels are longer, divided into different stages before you face a boss. Despite longer levels, there are only half as many levels in the game as in its predecessor. This is well balanced however, because one thing the Genesis has over the SNES is the ability to make the game run faster at the cost of the vibrancy present in the Super Nintendo game. Because of this, characters and enemies move faster and the enemies are much less forgiving. Even though the game is shorter, the increased difficulty makes up for it. I personally enjoyed the game despite my bias towards its older cousin. It was exciting for me to come across this game. It was like the day that you discovered there was a second Star Fox on the Super Nintendo. I was shocked that I had never heard of this game, yet I embraced it due to the legacy it was a part of. Though it did not feel as refined to me, that does not make it a bad game. I do not hold the view that it was just a Genesis knock-off, but as a separate game that throws back to its forbearers. Lol i just found one at goodwill $6. Definitely more challenging and faster paced than Turles in Time. Best action game on genesis. I love it, had it for years and usually break it out when friends come over to play vintage games, its a big hit. Aren't there any cases of Protestants in purgatory? Maybe they don't go there because they don't believe in it?